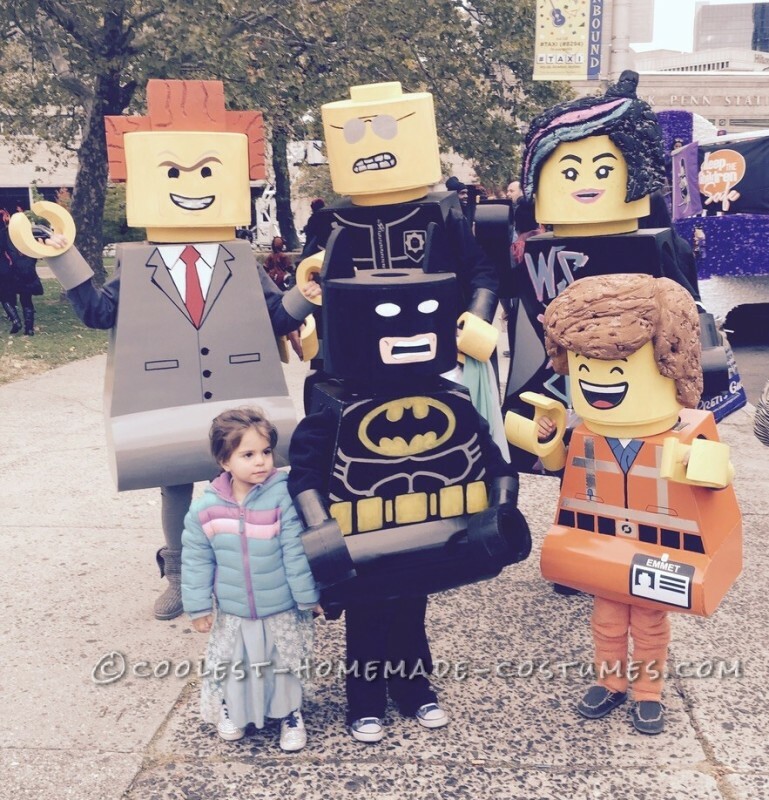 We value time spent with family and we wanted a costume theme that would reflect quality time with our family. 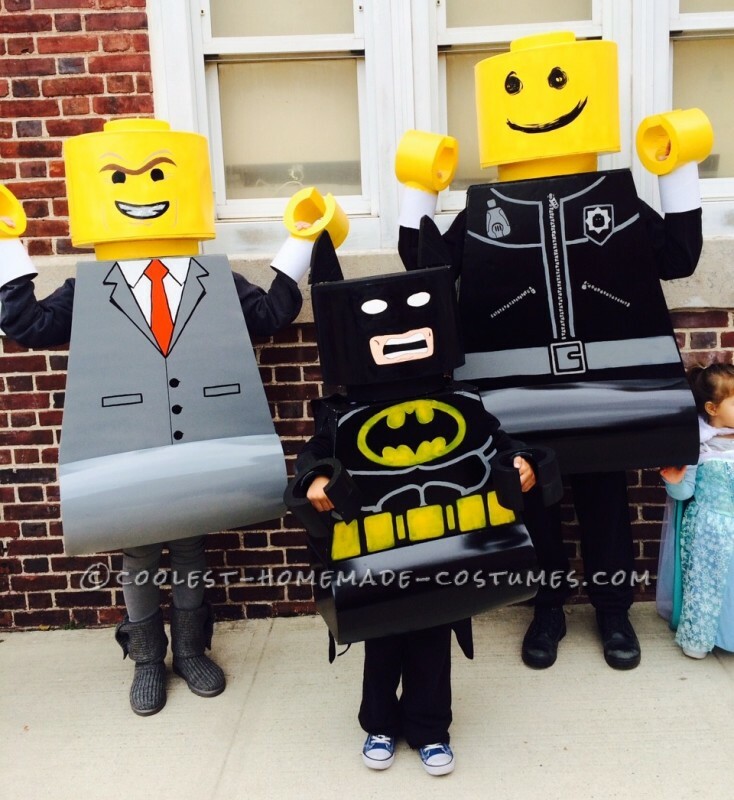 Not only do the Lego characters have a close relationship to each other, but the process of making the costumes involved a lot of collaboration between the people wearing the costumes and other family members who lent a helping hand. 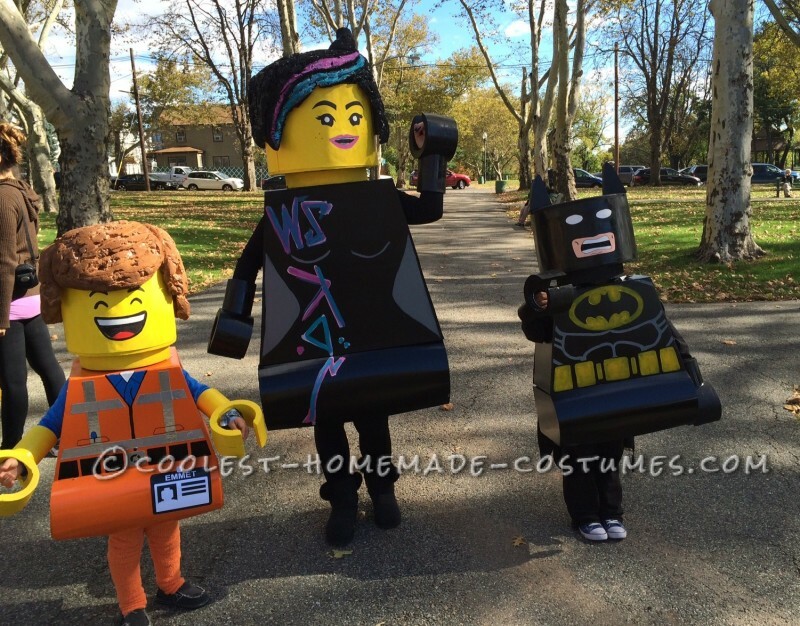 Wyldstyle (Sandra) and her son, Emmet (Tyler), along with Good Cop/Bad Cop (Stephen), his wife, Lord Business (Susan), and their son Batman (Evan), each had important roles in the making of the costumes. Stephen and Susan mainly focused their attention on the construction of the costumes, while Sandra painted and added all the creative touches. The children were involved from beginning to end, measuring, gluing, and practicing their best Lego impersonations. We mainly used Styrofoam, foam boards, expanding foam, poster boards, glue and paint to create these costumes. The heads were made out of circular Styrofoam pieces and then held up by Styrofoam supports. They were then covered with poster board. 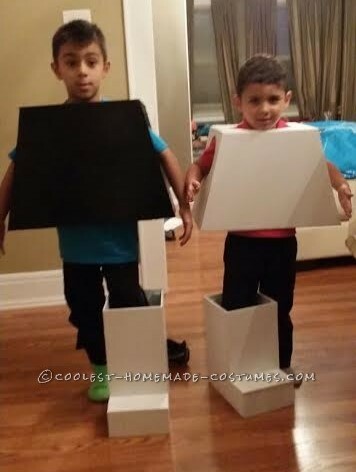 The bodies were created using foam boards (light and easy to work with). 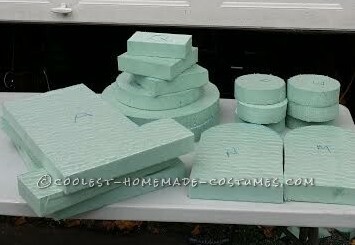 Each piece was cut separately and then assembled using hot glue guns and Styrofoam supports from the inside. 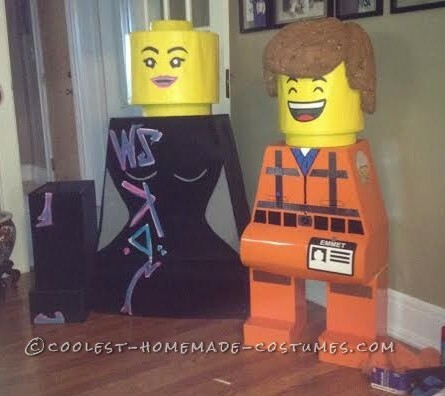 The legs were made from the same foam boards. The hands were created from Styrofoam by cutting out circles and then cutting out the other parts to create a Lego hand shape. We then attached a shipping tube to allow for ease when wearing. 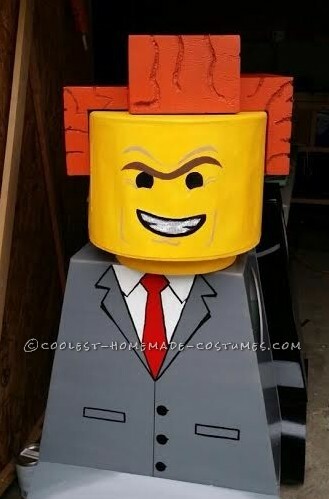 The hair was made using cans of expanding foam, allowed to dry, and then sanded down to the correct shape, as well as Styrofoam for President Business. By far, the hair was the most challenging part. 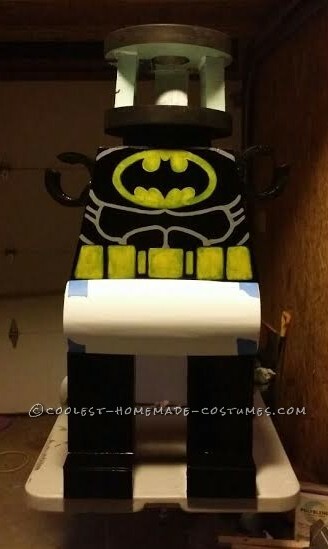 After the costumes were assembled they were painted with glossy latex paint and the other details were painted on with acrylic paint. While we were very happy with the results of the costumes, the reactions we received from both the children and people seeing the costumes, made us ecstatic. Evan, who has never wanted to dress up for Halloween, was so excited for his costume that he wore it for seven hours straight, despite it not being the most comfortable of costumes. Tyler hasn’t stopped talking about how much all the children in his class loved the costume and planning what his costume will be next year. As far as the reaction of people when we went trick-or-treating; it was the year that we got the least amount of candy! We couldn’t walk two steps without someone stopping to take a picture of/with us. As a matter of fact, when we went to a parade in Newark, NJ, the fire department had to help control the crowd around us and make them form a line to take pictures with us. We were even on Channel 12 news! We definitely did not expect to have such a wonderful reaction from people. 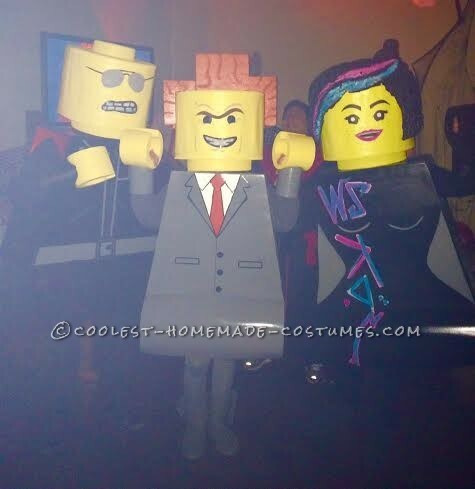 Adults and children alike, everyone loved our costumes and congratulated us on our hard work. The expression on our children’s faces was enough to get us pumped for next year’s Halloween. It was the perfect opportunity to bring family together and to share in the splendor that hard work brings.